ATLANTA (July 15, 2014) — Fifth Third Bank Broadway in Atlanta kicked off its 2014/2015 series in Atlanta this past Tuesday with the city’s debut of Disney’s The Little Mermaid featuring a special check presentation prior to the start of the show. The donation from the presenters of the first-class touring musicals was given to Bert’s Big Adventure, a nonprofit organization that provides a magical, all-expenses-paid, five-day journey to Walt Disney World® for children with chronic and terminal illnesses and their families. 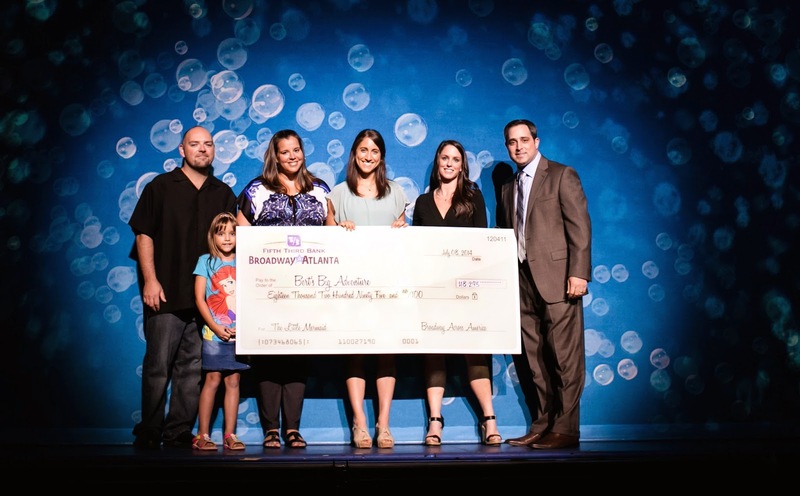 The contribution was a result of previous ticket sales for the Atlanta debut of the series’ musical The Little Mermaid, which runs at the Fox Theatre until July 13, 2014. For every ticket sold during pre-season, $5 was donated to benefit the Atlanta-based nonprofit organization. Broadway in Atlanta proudly announced that they raised a total of $18,295 for the local nonprofit organization. This donation will help the charity fund year-long programs for Bert’s Big Adventure such as the Reunion Adventures, the Fairy Godparent program, and the 2015 annual trip to Walt Disney World®.